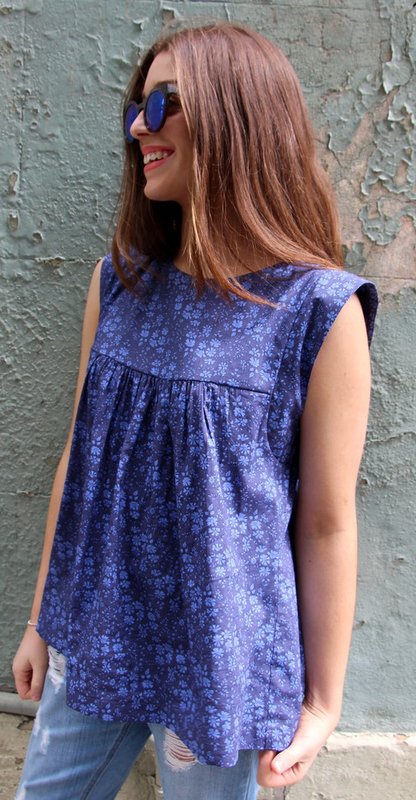 Yesterday I showed you my Alice Top, made from a pattern by Tessuti. Today I am going to illustrate the steps I took to adjust the front yoke and armbands for a full bust. It is always best to make a muslin/calico for fitting but this uses a quicker short cut. Cut all the pattern pieces from your main fabric, except for one pair of the armbands (you can cut the facings later). Cut a pair of armbands from a waste fabric such as muslin/calico. Interface the back armbands, so they don’t loose their shape. A stiff muslin/calico should be able to hold-up to the following manipulations, without warping, but interface the “front” armbands too, if you want. Stitch the yoke shoulder seams together. Gather between notches of front and back. Stitch back yoke to back bodice, matching notches. 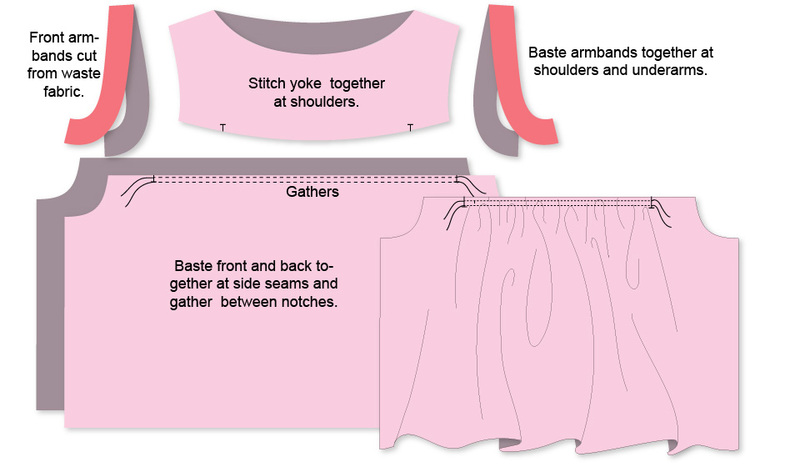 Machine baste the back armbands together with the front armbands at shoulder and underarm seam. Set these aside for now. Machine baste front yoke to front bodice, matching notches. Machine baste side seams. Try top on. If you are larger busted, you will have a gape of fabric forming from your bust point to your underarm. 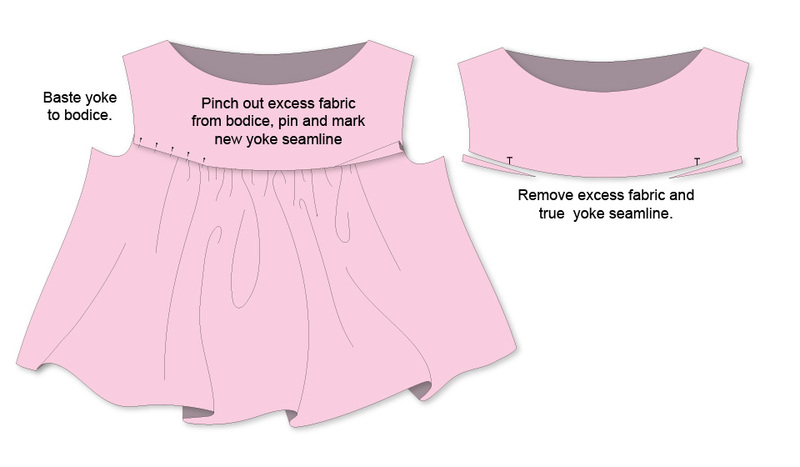 Pinch out this excess fabric from the yoke and pin a new seam line. Keep the pins in the front yoke to mark excess fabric and gently remove the basting stitches. I pinched out a little over 1cm of fabric at the armhole. Draw a new smooth line for the bottom of yoke. The new seam line of the yoke will be more curved. Mark notches. Stitch the front yoke to front bodice, matching notches. Stitch side seams together. I used french seams for these, as they were the only seams that weren’t lined. Machine baste armband to yokes and bodice, pinching and pinning out excess fabric in front armbands. Try on top, you may need to tweak the amount of fabric pinched in the ‘”dart”. Place pins to hold the new front armband “dart”. Unpick the basted seams, being careful to keep the pins in place over the front armband “dart”. Redraft a new front armband based on the pinned template, truing all seam lines. Cut a pair of front armbands from main fabric and interface. 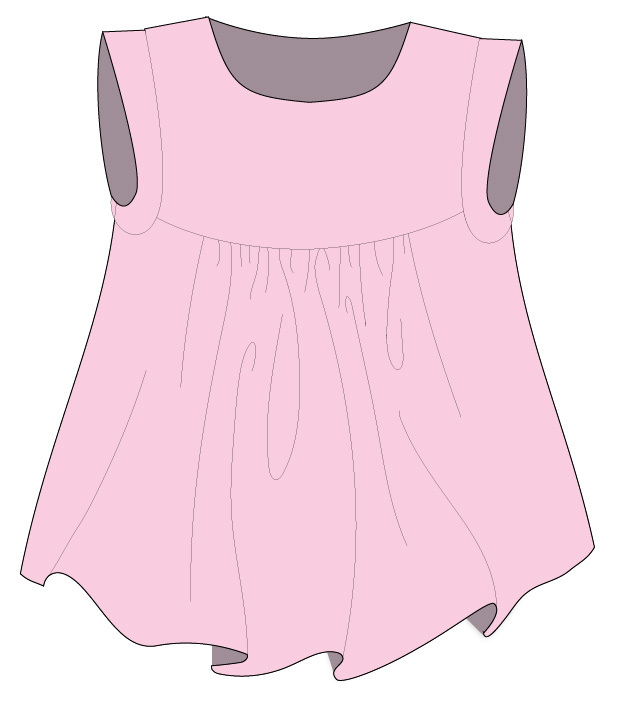 Complete the sewing as usual, with your new redrafted yoke and armbands. Cut a pair of the armband facings from the back armband pattern and a pair from the front. 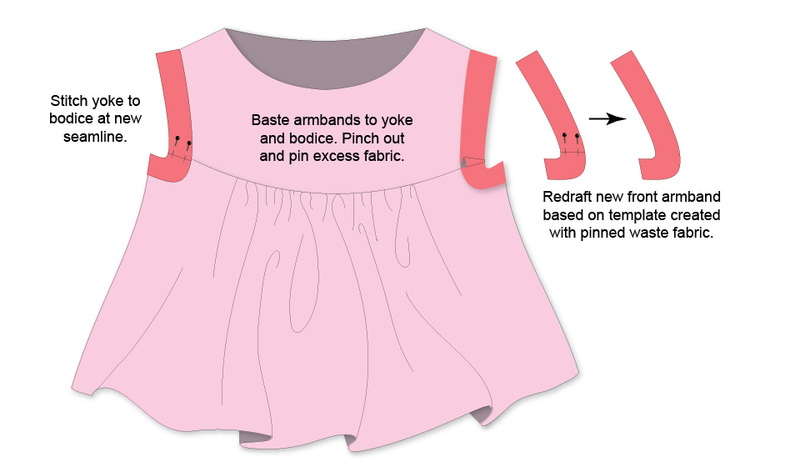 You may want to trace these changes through to your pattern pieces so that you can reuse them. I certainly have. There’s a dress on my wishlist next. 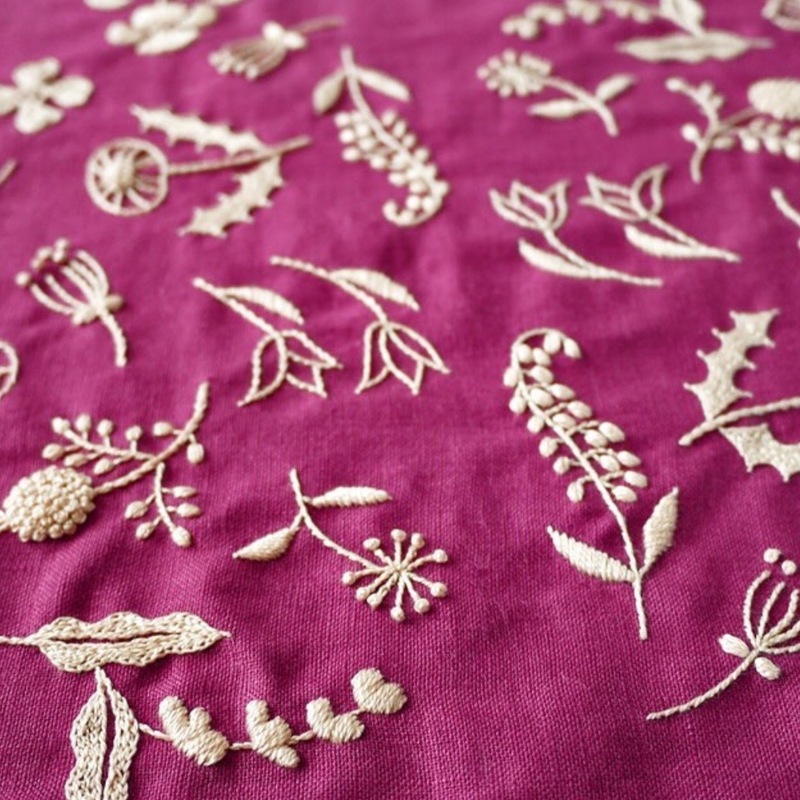 I have some pink linen that I’d like to embroider for a yoke like this embroidery by Yumiko Higuchi. What a great tip to use muslin only for those pieces that are likely to need alterations! I like the way you think. I’m a big fan of fit-as-you-sew, and tend to prefer styles with seams that allow for easy alterations. PS I am @whatkimdoes on Instagram. I am really enjoying these blog posts, and was excited to learn of the pattern line. Thanks Kim, it is nice to hear from you on this site! What suggestions do you have for raising the underarm so your bra doesn’t show? I just finished this top yesterday and love it except for the large underarm. Will you make another one or do you want to raise the underarm of the one you have? As I recall this has a separate underarm piece so I would redraft it with a high armscye. Tape a piece of tissue to your finished top and redraw the armscye as you want it.